People ask if Cate is excited she’s getting a brother. Truthfully, Cate has no idea what getting a brother is going to be about. We talk about having a baby. She knows his name is Ben. She knows he’s going to wear the tiny diapers she noticed in her closet the other day. Most of the time she talks about giving him hugs and kisses, although she did mention throwing the baby the other day, and I quickly explained (again) that she has to be gentle with any baby. Earlier this week I did some baby laundry as I was sorting the clothes people have been kind enough to give us. 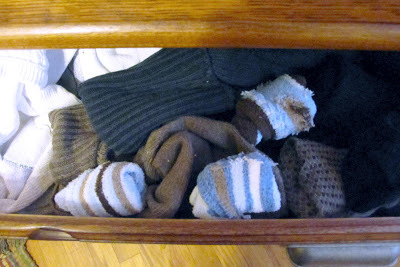 Cate must have decided she wanted to help because I found Greg’s sock drawer opened with these little pairs of socks laying there like they belonged. She is going to be such a good big sister.